EuroGeoSurveys President, Dr. Zdenek Venera, opened the EGS Directors Workshop on the need for European geoscientific data and knowledge in EU policy developments and the EGS strategy explaining how the National Geological Surveys, members of EuroGeoSurveys (EGS), are public sector institutions carrying out operations and research in the field of geosciences, with a long tradition in collecting data, preparing information and conducting research focused on their national subsurface. 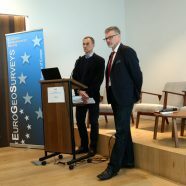 Besides their national mandates, EGS members play an important role in EU policy developments by providing the European institutions with geoscientific data and knowledge for the benefit of society. Click here to view/ download the file.